What a debt is owed to the hundreds of people whose vision, labor and sacrifice have shaped our religious community! It began with the first service held in Northport on December 7, 1947. The congregation was officially incorporated under the laws of New York State as The Unitarian Fellowship of North Suffolk in 1956. It moved to Huntington, meeting first in Temple Beth-El on Park Avenue. In 1957, the Carter House on Gaines Street was purchased. Following membership expansion, the congregation purchased four acres at 109 Brown’s Road in 1962. 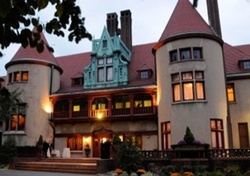 The property was originally part of the McKesson Brown Estate (which is now Suffolk County’s Coindre Hall Park). In 1965, after the merger of the Unitarian and the Universalist denominations, the congregation’s name was formally changed to The Unitarian Universalist Fellowship of Huntington (UUFH). In 1984, a new sanctuary was built! The bold move to construct a new building exemplified commitment to the principles and purposes of Unitarian Universalism as well as to fostering spiritual and intellectual growth. The UUFH members and friends committed to respect each person’s unique journey, to nurture children and youth in a loving, supportive religious environment, and, for the larger society, to witness and act on issues of social justice. The UUFH remains a vital congregation of caring people eager to welcome you. The union of the Unitarian and Universalist denominations was many years ahead, but the history of liberal religion in Huntington might well be dated to the 1836 establishment of The First Universalist Church of Huntington. Their church building was on the southwest corner of Main Street and New York Avenue, and the congregation thrived for many years, but in 1913, with membership decreasing, the church was disbanded. In the mid 1940’s, under the leadership of Robert Brockway, then a student of religion, a small group of people began to discuss forming a Unitarian church. Their discussions culminated in a first Unitarian service, held in the evening of December 7, 1947, in the Methodist Church of Northport. Regular services began under Brockway’s leadership, and on March 21, 1948, the group adopted By-Laws and a Statement of Purpose. This small gathering of churchgoers would eventually become the Unitarian Universalist Fellowship of Huntington. At the start, the group defined themselves as the Unitarian Church of Northport, and in time applied to both the American Unitarian Association and the Universalist Church for official recognition. Because there were fewer than 50 members of the church – the minimum requirement for Unitarian church status – the Unitarian Association gave official recognition to the congregation not as a church but as a fellowship. The group thus became part of the denomination’s new program granting official fellowship recognition to small groups who were seeking affiliation; however, for some time the group continued to describe itself as a church. The Universalist Church denied the group’s request for dual affiliation. In 1956, the congregation moved to Huntington. Meetings were held on Sunday afternoons at Temple Beth-El on Park Avenue. A year later, the congregation purchased the Carter House on Gaines Street. On March 7, 1957, the congregation was officially incorporated under the laws of New York State under its new name, The Unitarian Fellowship of North Suffolk. Eventually, the Sunday School expanded into the whole of Carter House, and adult services were moved to the Huntington Masonic Temple. As membership continued to grow, the congregation concluded that both new quarters and professional leadership were necessary. 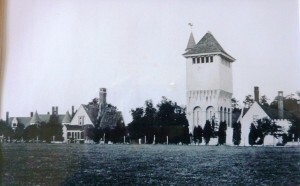 In 1962, the congregation purchased three buildings on four acres of the former McKesson Brown Estate – the “farmhouse,” now known as the cottage, the garage and servants’ quarters, and a 70-foot high water tower. Throughout the summer, members labored to convert the garage and servants’ quarters into a worship hall, social hall, kitchen, classrooms, and offices. Members found joy in their new space, but by the late 1970’s, with membership at 250, the space was no longer sufficient. The imposing water tower – a much-beloved landmark – stood on what was deemed the only feasible land for expansion. With heavy hearts, members voted to demolish the tower. The new main hall that rose in its place was not as tall, but it too reaches skyward, to where aspiration leads. On February 6, 1965, after merger of the Unitarian and Universalist denominations, the congregation again changed its name and became what it is today, the Unitarian Universalist Fellowship of Huntington. Unitarian (and later Unitarian Universalist) church polity is not hierarchical. The congregations themselves conduct ministerial searches and make the official call to service. On June 17, 1962, the congregation voted without dissent to call the Reverend Ralph Stutzman as its first full-time minister. It also voted to maintain a strong lay Program Committee. Sunday services would be shared between minister and lay leaders, a tradition that continues to the present day. Reverend Stutzman remained with the Fellowship for eighteen years. He was followed by four full-time ministers: the Reverend Bruce Marshall, the Reverend Beth Graham, the Reverend Paul Ratzlaff, and our current minister, the Reverend Jude Geiger. The fifty-five year span represented by these five ministers speaks to the strong relationships that we have been able to enjoy with them. In 1948, the congregation started its first Religious Education program. Beginning with just a few youngsters, Religious Education has become a vital and compelling aspect of this religious community. Currently, the Fellowship program, under the professional leadership of Starr Austin, offers a variety of curricula from pre-school to high school. A one-week summer camp on Shelter Island, Sophia Fahs, has been popular for many years. 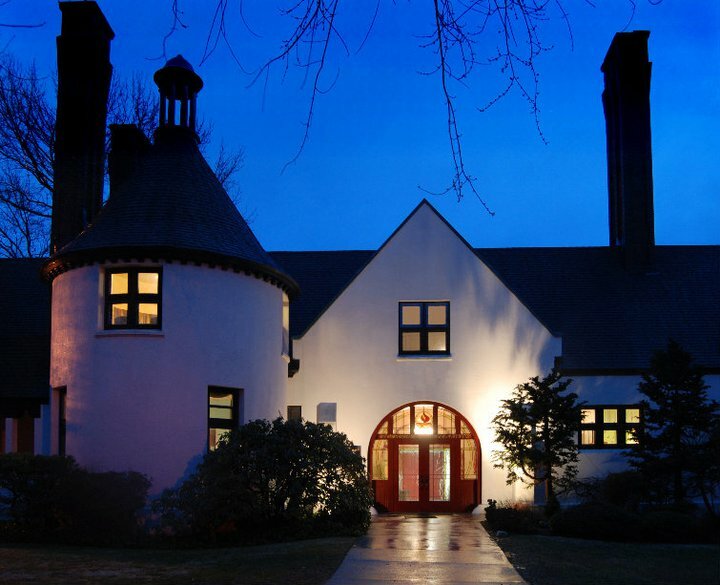 Since the 1970’s, the Fellowship, in conjunction with other Unitarian Universalist congregations, has offered interested teens the program “About Your Sexuality.” Under an expanded scope, the program is now known as “Our Whole Lives.” Fellowship students attend these programs with teens from other Long Island UU churches and fellowships, often forming friendships that continue after their participation in the programs has completed. For over two decades, the Fellowship held an annual Memorial Weekend Renaissance Faire. From a modest start in 1972, the Faire grew to include numerous arts and handicraft booths, stages for performing groups, jousting by the Society for Creative Anachronism, elaborate costumes, music, food, and children’s entertainment. At its peak, the Faire attracted about 6,000 visitors, bringing contact with neighbors, businesses, group homes and the general public. Members experienced the joy of working together on a major undertaking, and the Faire became a significant community event. In time, however, the congregation decided that too much effort was being taken up by the Faire. Members wished to pursue issues of spiritual significance, especially in areas of personal growth and social justice. The Faire came to an end, but the friendships formed in those days still warm our collective memory. In 1957, the Fellowship organized its first Social Justice Committee, presenting a public program to the local community, “Why Substandard Housing.” The Fellowship and its members began their focus on a variety of social justice issues: affordable housing, desegregation, the Vietnam War, and reproductive rights. Members demonstrated for civil rights both in Huntington and Selma, Alabama, signed anti-segregation petitions, sponsored the Freedom School, and joined the Congress for Racial Equality. Over the years, that social justice focus expanded to take on issues of peace, poverty, GLBT (gay, lesbian, bisexual and transgender) concerns, and the AIDS crisis. The Fellowship participates with the Huntington Interfaith Homeless Initiative (HIHI). From November through March, the Fellowship and different churches in the Huntington area, in association with the Family Service League, offer a night’s shelter, dinner, breakfast and a bag lunch to a number of the town’s homeless population. Members also work in support of the Huntington Food Council, an organization that makes emergency food distributions within the Town, and the Star Child program, which provides toys for needy children during the Christmas-Hanukkah season. Members lend their efforts to environmental issues and participate in Housing Help,PFLAG (Parents and Friends of Lesbians and Gays), the Huntington Boys and Girls Club, and just recently, a 5K Walk/Run to raise funds for the Darfur Relief Fund. Issues of social justice have been and remain an abiding concern of our religious community. In the early 1980’s, we began the work to create a Memorial Garden. Brush was cleared, trees pruned and open grassy areas developed to create space for a garden of reflection. For those who wish, cremains of members and friends may be interred in the garden. Names and brief biological sketches may also be memorialized on a panel at the rear of the worship hall. Throughout the Fellowship’s history, members who are musicians have made a unique and wonderful contribution to the life of the community. Singers, choir directors and instrumentalists of every kind have enhanced Sunday services and performed a number of afternoon and evening concerts, even producing two nationally-heard recordings of early American music. Each month, the Fellowship gallery mounts exhibits by local painters, photographic artists and sculptors. Some work is by Fellowship artists; some produced by outside artists. The art has been beautiful, arresting and sometimes challenging, and has added immeasurably to Fellowship life. The Fellowship is a beloved religious home ready to welcome curious visitors at any time. We hope that you will enjoy your visit and return again and again, until you too call the UUFH your beloved religious home.